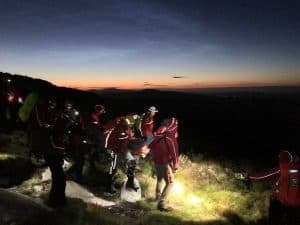 At 22:22 on Thursday, June 21st, The Glen of Imaal Mountain Rescue Team and Dublin & Wicklow Mountain Rescue Team were tasked by An Garda Síochána (AGS) to assist with an incident in Glendalough. 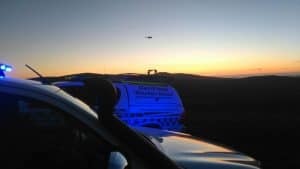 Emergency services were alerted by a group, who were camping in the area, when one of their party fell and sustained a head injury. 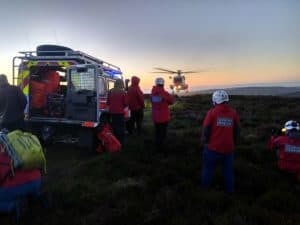 Mountain rescue (MR) personnel, assisted by Rescue 116, searched Glendalough and located the group above the Miner’s Village. The group were medically assessed, and the injured party was treated and packaged into a stretcher for evacuation. The patient was stretchered to a suitable helicopter landing zone. 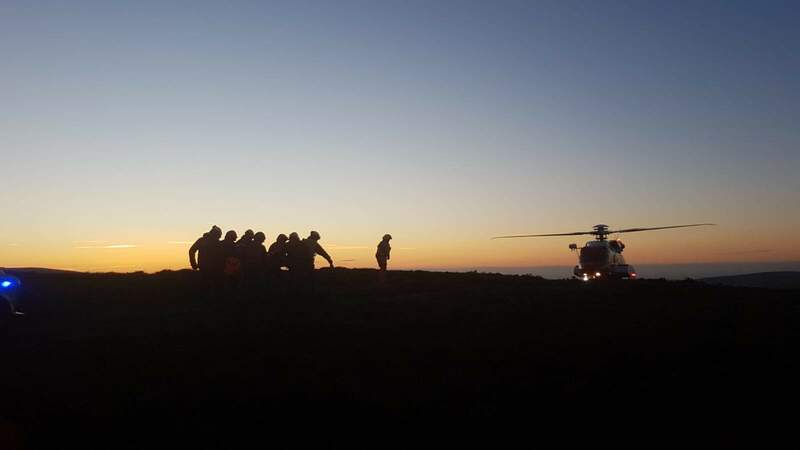 At first light, Rescue 116 returned and airlifted the patient, accompanied by an MR doctor, to hospital. All personnel were safely off the hill at 05:40 and the incident was stood down. We’d like to thank Rescue 116, for the initial search, and the evacuation; the Irish Air Corps, who were on standby; the National Ambulance Service; and An Garda Síochána for their assistance.